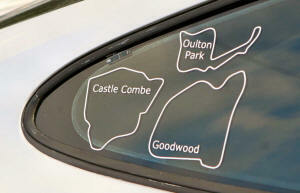 For the first time a complete range of decals covering world wide Motor Racing Circuits, Track Day Circuits and Airfields used for automotive events. This includes cars, motorcycles and go-karts. Once you've driven the circuit, you've earned the decal ! Make it a lasting experience and let others know that you've done it. For the track-day regular, build up your collection as you work your way through them. Available in two outline thicknesses of 1.5 or 3mm, these are in a consistent size of approx 100mm width as displayed below ! Each circuit comes with the text (8mm high) separate so you have total control over text placement, or just using the circuit outline on it's own. These decals have been uniquely designed to allow you maximum flexibility in terms of decal position, rotation and optional positioning of text. 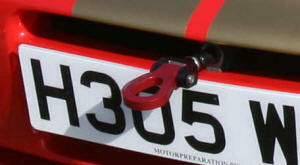 We have forged links with many car clubs, track day companies and events organisers who will furnish you with a code to specify at time of ordering to additionally include the relevant event, club or organiser's decal FREE OF CHARGE. Ask your organiser for details. Outlines - Outlines - Outlines of countries, ring-roads etc.